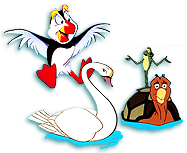 Welcome to Far Longer Than Forever the approved fanlisting and fansite/shrine/tribute for the 1994 animated film The Swan Princess, based on the ballet "Swan Lake". Starring the voice talents of Academy Award-winner Jack Palance, John Cleese, Steven Wright, and Sandy Duncan, the film is directed by a former Disney animation director, Richard Rich, with a music score by Lex de Azevedo. There were two sequels. Far Longer Than Forever copyright © 2010 Courtney (Drusilla). Part of the Love-Sick fanlistings collective.